our provider informed us about an important network maintenance happening on the 28th of May 2009 between 03.00 and 03.30 (GMT+1) which might cause brief interruptions. These interruptions are indeed supposed to be very short and should not be longer than a few seconds. Most Chilp it! users will not even notice these upgrades. Well, if you’re running into timeouts feel free to try again after a few seconds. We like to apologize in advance for any inconvenience this might cause. Anyway, keep on shortening and have a fine day. The short URL for “About:Blank” has been clicked a couple of hundred times. The question is only: Why? Social media networks like Twitter.com are a fantastic way to share news, information or blog posts. Since every message has a maximum lenght of 140 characters the best way sharing links is with the help of URL shortening services. This php code adds a “Share this on Twitter” – shortcut to your WordPress site and helps creating short links on the fly. Feel free to use this script for developing other ways of integrating Chilp it! 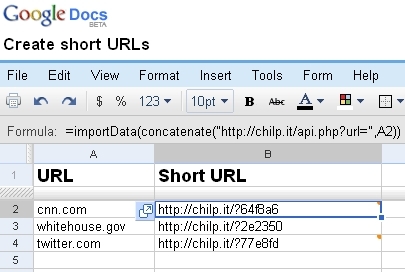 URL shortening into your website, blog or application. The script can also easily be changed to support other social networks like Friendfeed or Facebook. You may have the need to convert regular web addresses into shorter URLs within your docs automatically. Get ready, it’s fairly simple to setup and way easier than you think. Copy the formula and paste it into the fields you want to use. You need to change the field “A2” to the corresponding long URL field. After entering the long URL in the chosen field, the magic happens and the formula creates a short URL. Your done. Easy does it. Let us know if you’re having trouble setting this up.